Actual red blood cells in fossil bones from a Tyrannosaurus rex? With traces of the blood protein hemoglobin (which makes blood red and carries oxygen)? It sounds preposterous—to those who believe that these dinosaur remains are at least 65 million years old. The story starts with a beautifully preserved T. rex skeleton unearthed in the United States in 1990. When the bones were brought to the Montana State University’s lab, it was noticed that ‘some parts deep inside the long bone of the leg had not completely fossilized.’ To find unfossilized dinosaur bone is already an indication more consistent with a young age for the fossils (see More on fresh dino bone, below). Let Mary Schweitzer, the scientist most involved with this find, take up the story of when her co-workers took turns looking through a microscope at a thin section of this T. rex bone, complete with blood vessel channels. Looking for dinosaur DNA in such a specimen was obviously tempting. However, fragments of DNA can be found almost everywhere—from fungi, bacteria, human fingerprints—and so it is hard to be sure that one has DNA from the specimen. The Montana team did find, along with DNA from fungi, insects and bacteria, unidentifiable DNA sequences, but could not say that these could not have been jumbled sequences from present-day organisms. However, the same problem would not be there for hemoglobin, the protein which makes blood red and carries oxygen, so they looked for this substance in the fossil bone. To claim that bone could remain intact for millions of years without being fossilized (mineralized) stretches credibility. The report here of red blood cells in an unfossilized section of dinosaur bone is not the first time such bone has been found. Because it contains iron, heme reacts to magnetic fields differently from other proteins—extracts from this specimen reacted in the same way as modern heme compounds. To ensure that the samples had not been contaminated with certain bacteria which have heme (but never the protein hemoglobin), extracts of the dinosaur fossil were injected over several weeks into rats. If there was even a minute amount of hemoglobin present in the T. Rex sample, the rats’ immune system should build up detectable antibodies against this compound. This is exactly what happened in carefully controlled experiments. Evidence of hemoglobin, and the still-recognizable shapes of red blood cells, in unfossilized dinosaur bone is powerful testimony against the whole idea of dinosaurs living millions of years ago. It speaks volumes for the Bible’s account of a recent creation. M. Schweitzer and I. Staedter, The Real Jurassic Park, Earth, pp. 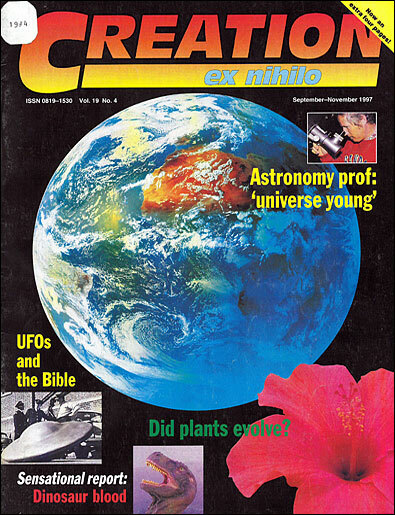 55–57, June 1997. Return to text. The T. Rex blood cells were actually first noticed by a professional pathologist casually interested in looking at such an ‘old’ piece of bone under the microscope. Return to text. Creation 14(3):16. The secular sources were Geological Society of America Proceedings abstract. 17:548, also K. Davies in Journal of Paleontology 61(1):198–200. Return to text.